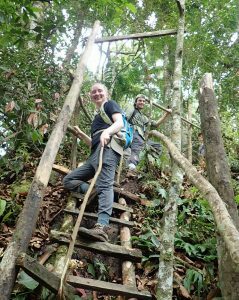 Cerro Chucantí is an isolated massif that lies within a key biological transition zone between two global biodiversity hotspots on the edge of the Darien Province in eastern Panama. It rises to a peak of 1439m (nearly 5,00ft), and sustains a rare cloud forest ecosystem in the cooler area near its peak – the only cloud forest habitat for over 100km. The geographic isolation of the Cerro Chucantí mountaintop has allowed its fauna and flora to differentiate considerably, such that it contains several locally endemic species and subspecies found nowhere else on Earth. The forests of Cerro Chucantí also continue to harbor populations of threatened species, like the Critically Endangered Black-headed Spider Monkey (Ateles fusciceps rufiventris) and the Endangered Baird´s Tapir (Tapirus bairdii), as well as Vulnerable species, such as the Great Curassow (Crax rubra) and Puma (Puma concolor), whose populations are extremely vulnerable to habitat loss, fragmentation, and overhunting. Cerro Chucantí has been designated an Important Bird Area by the Panama Audubon Society and is rated as a High-Priority Endemic Bird Area of the World (EBA 024: Darien Highlands) by Birdlife International with specialties like the endemic Beautiful Treerunner (Margarornis bellulus), an endemic race of Russet-crowned Quail-Dove (Geotrygon goldmani oreas), and an undescribed race of the Varied Solitaire (Myadestes coloratus spp.). Unfortunately, the forests of Cerro Chucantí are under severe threat from deforestation for logging and the creation of cattle pastures. As you read this, hundreds of trees are being harvested in the tropics, and the remainder of forest is being burnt to the ground and replaced with grassland to feed cattle. These pastures, although beautiful, feel like deserts compared to the wonderfully diverse old-growth tropical forest still found near Cerro Chucantí’s peak and threaten the security of the mountain’s watershed, upon which the surrounding residents depend. Learn more about the Cerro Chucantí private reserve, including interactive maps! 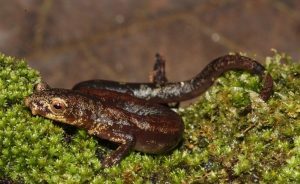 Brand new species of plants and animals have been discovered at Cerro Chucanti! What do we know about them so far? When our founder, Guido Berguido, first visited Cerro Chucantí in 2003 with biologist Rafael Aizprua, he was hoping to see some of the less common bird species in Panamá. Near the peak of Cerro Chucantí, Guido got his wish: he saw a Beautiful Treerunner (Margarornis bellulus) and several Varied Solitaires (Myadestes coloratus) among other species. These birds were only known to occur in the Darien highlands near the Columbian border, and their discovery at Chucantí sparked Guido’s interest. As he returned to Cerro Chucantí with other birders, Guido noticed that more and more of the mountain was being cleared for logging and cattle ranching. Eventually Guido decide that enough was enough – something had to be done to stop this madness! 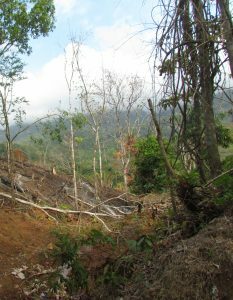 Although he was able to arrange the purchase of 42 hectares near the peak of Chucantí, the landowner surprised Guido by selling the logging rights to the property before selling the land himself. Luckily, Guido was ale to persuade the logging company to sell the rights back to him for the original price: a mere $12 per 300-year-old tree! This original purchase eventually became the Cerro Chucantí private reserve, and ADOPTA was created to manage the reserve. Today the reserve is over 1,500 acres and continues to grow through the support of our partner organizations and amazing staff and volunteers. Cerro Chucantí hosts an amazing amount of diversity – from common ants to endangered primates. Here’s what scientists have encountered in the reserve so far. 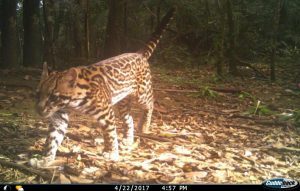 Cerro Chucantí and the surrounding Majé mountains are in peril! Here are the main threats and what we’re doing to protect the environment in the Chucantí reserve.